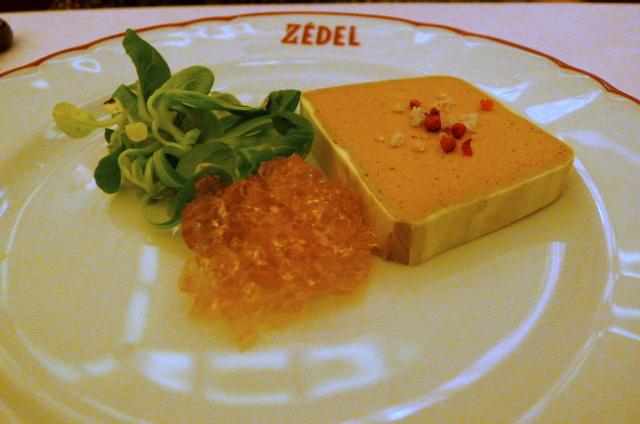 The latest addition to Jeremy King and Chris Corbin’s ever-growing restaurant empire is Brasserie Zédel, their third restaurant after The Wolesley and The Delaunay. Like its older siblings, Brassiere Zédel has been decorated in the style of a grand Parisian café with high ceilings and lots of marble. Millions was obviously pumped into its design. 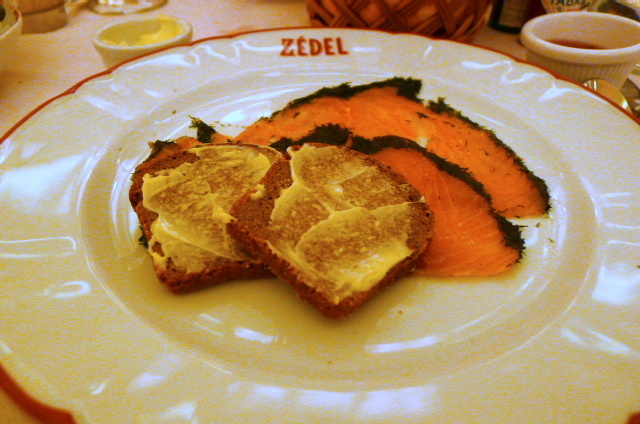 Brasserie Zédel occupies the space that was previously The Atlantic, right in the heart of Piccadilly Circus. 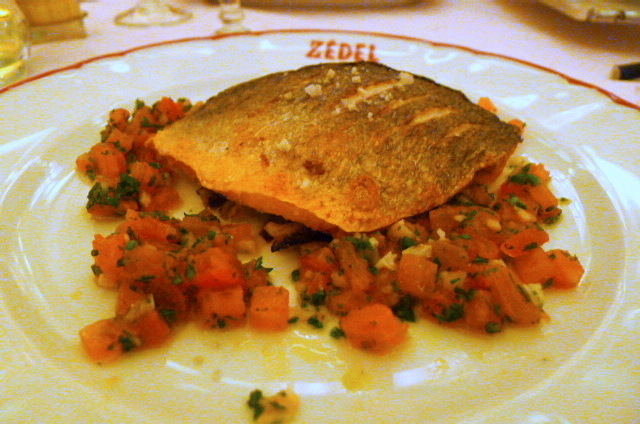 With its Central London location, what is most surprising about Brasserie Zédel is its prices, which are exceptionally reasonable. The restaurant is housed in the basement, right next to the Bar Américain. There is also a café at the entrance to the restaurant on the ground floor. Parfait de foie gras (£8.75) tasted predominantly of chicken liver. It was tasty if a little salty. The accompanying sauterne jelly was bland, and consequently this dish lacked for some acidity. Saumon mariné à l’aneth (£6.50), cured salmon with chives, was decent. Pan-fried fillet of sea bream (£13.50) was fresh but would have worked better with 30 seconds less cooking time for a moister finish. The accompanying fennel was beautifully caramelised but the tomato concassé also proved to be bland. The dish would have benefited from a sauce. 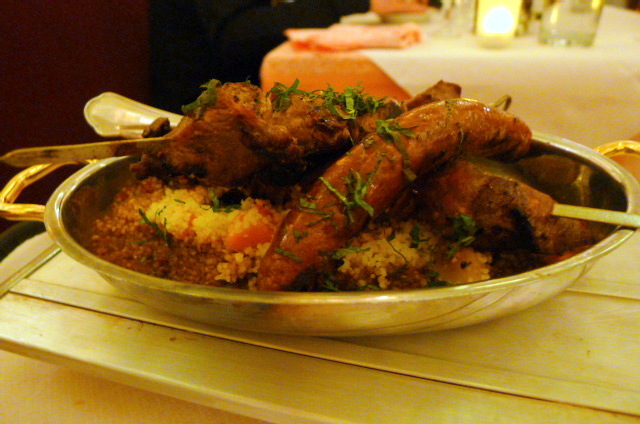 Couscous with lamb, lamb’s liver and spicy sausage (£12.75) sounded better than it tasted. The lamb was tender if not particularly flavoursome, and the liver was a little dry. The sausages were full of meaty goodness if a touch over seasoned. 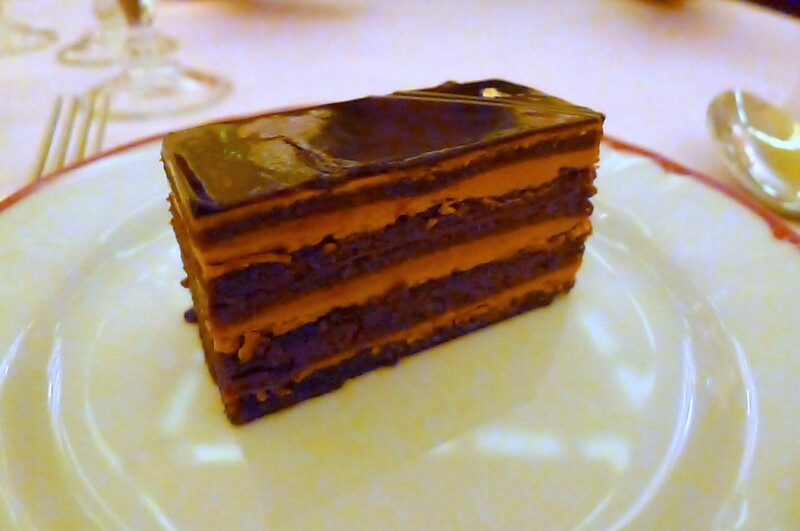 Gâteau Opéra (£3.50) consisted of layers of chocolate sponge and coffee cream rather than the more typical triple layering of joconde sponge, chocolate ganache and coffee cream. It was nice but it didn’t quite hit the high notes of complexity that this cake is normally meant to achieve. The service was respectable but we had to repeat requests for certain items on a couple of occasions. To keep prices low, certain corners were obviously cut which would account for the blandness experienced in some of the dishes. There were signs of potential, but none of the dishes quite made the mark. But if you compare it to similarly priced restaurants, or your run-of-the-mill high street French brasseries like Chez Gerard, then Brassiere Zédel beats those hands down in terms of both food and glamour factor. With such good value for money in such chic surroundings, Zédel is onto a winning formula in these financially stricken times. Price range: About £15 – £42 per head. Excludes drinks and service. Wow! That’s a nice review. That foie gras looks though. It doesnt sound like you rated the food all that high? The food was good, not great. But all things considered, the location, the setting, it was good value for money.